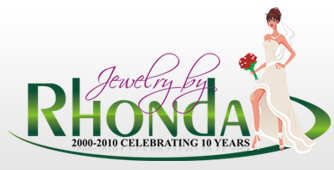 Bridal Jewelry, Bridesmaid's Jewelry, Mother's Jewelry, Flowergirl Jewelry, and more! Roses have existed since prehistoric times according to fossil remains. Roses first appeared in Asian gardens more than 5,000 years ago. Cleopatra scattered roses at the feet of Mark Anthony. Romans used roses for ornamental purposes. Nero released roses from the ceiling during feasts and banquets. Legend has it roses blushed with shame when Adam and Eve were cast out of the Garden of Eden. According to Roman legend, Rodanthe was a beautiful woman than many men wanted to marry. She turned them down and they kept wooing her. In their zeal to win her over, her door was broken down. The goddess Diana was angered and turned her into a rose and the suitors into thorns. According to English superstition, if the petals fall from a fresh-cut rose, bad luck will soon follow. A red rose is the flower of Eros (Cupid). 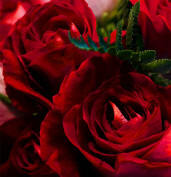 Red roses stand for "I love you". One rose means perpetual love and two roses together stand for commitment. A thornless rose stands for love at first sight. Since Victorian times, people have used flowers to express feelings - especially roses. In Wales, a white rose symbolizes innocence and silence. To Native Americans, a white rose means security and happiness. A white rose is considered to be the flower of the Virgin Mary. White roses symbolize spiritual love, eternal love, innocence, and purity. If a bride carries white roses, it means happy with love. The cabbage rose is the "ambassador of love". The tea rose is for remembrance. A garland or crown of roses represents virtue and merit. Yellow roses signify friendship, joy and gladness. Coral and orange roses mean desire, fascination and enthusiasm. Lavender roses mean love at first sight. Light pink roses imply grace, gentility and admiration. Dark pink roses say "Thank you". Any pale-colored rose symbolizes friendship.